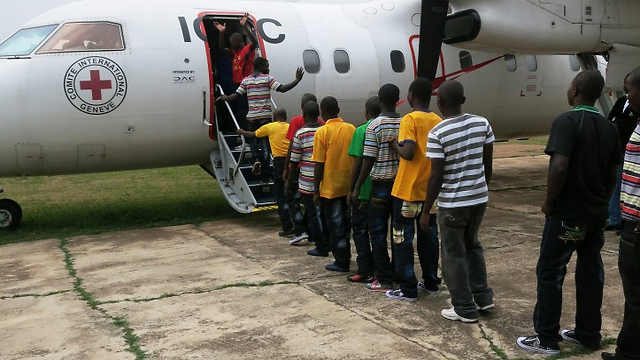 In the photo: A group of demobilized children boards an ICRC plane at Kamina military base. The plane will take them to their homes in the north-east of the country. The group included 147 boys and five girls, who had all belonged to armed forces or groups that disregard international humanitarian law. The phenomenon of children-fighters is common in many places around the world, and it is estimated that there are more than 300,000 children who were kidnapped from their home and forced to serve as soldiers. 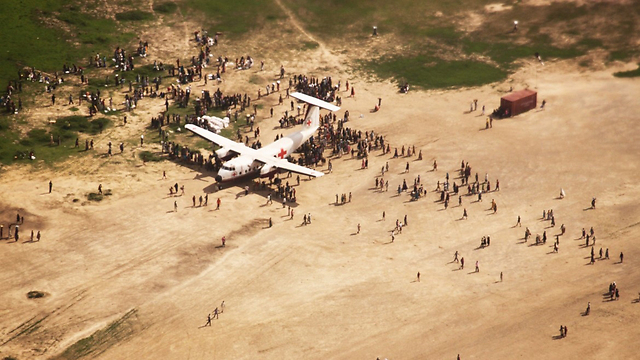 In the photo: Leer County residents in southern Sudan congregate around the ICRC plane, which brought supplies and equipment to the remote area. In the photo: The ICRC team visits orphans who lost their parents to the Ebola disease in Monrovia, the capital of Liberia. After dealing for more than a year with the worst Ebola outbreak in its history, Liberia has just been declared Ebola-free. According to the Liberian authorities, the disease left in its wake nearly 4,500 Ebola-affected children, of whom 3,000 have lost one or both parents to the deadly virus. 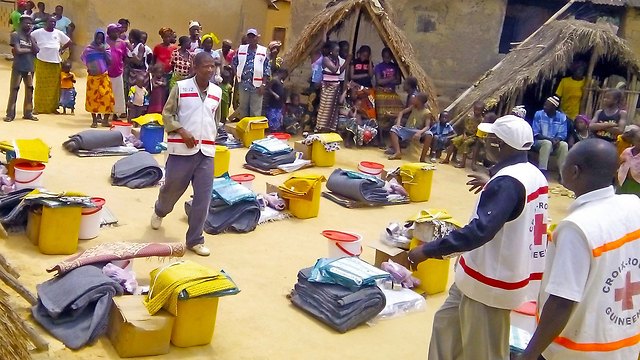 In the photo: ICRC volunteers provided assistance to 150 families affected by Ebola in Gueckedou, Guinea. The families received mattresses, blankets, cloths, soap, mosquito nets and cooking utensils. 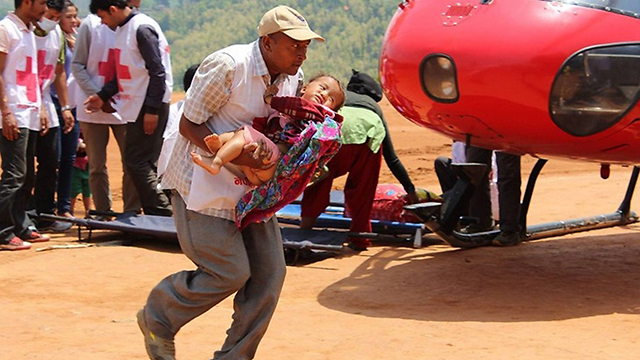 In the photo: When the first earthquake tore through Dhading district, in Central Nepal, this Nepal Red Cross Society (NRCS) volunteer placed people with terrible injuries on stretchers, gently assuring them they would be fine, and helped children. The local children gave him the nickname “Ambulance Uncle”, as he ferried injured children and adults on his back to the local hospital. In the photo: Family members injured in Al-Joumhouria hospital in the city of Aden in Yemen. 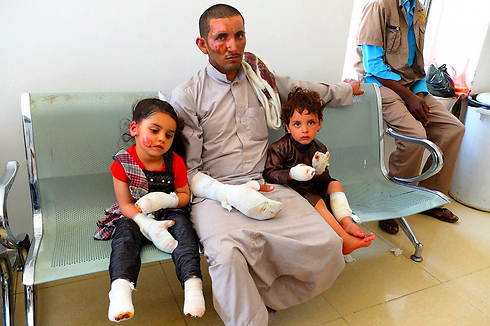 The war between government forces and Shiite Houthi rebels claimed the lives of thousands and injured thousands more, including members of the family in the picture who suffered second and third degree burns. In general, the hospitals in Yemen have difficulty treating all the sick and wounded due to their large number and in view of the shortage of equipment and supplies. 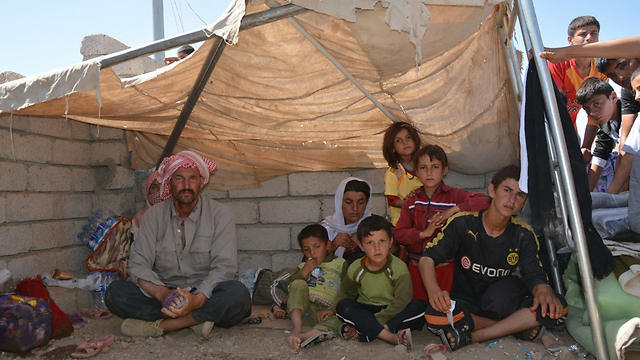 In the photo: Iraqi families who fled their homes due to the armed conflict, including between the “Islamic state” and government forces, took shelter under cover of a canopy in the city of Chenequa. Later they were taken to a nearby aid camp, not far away, where they will spend the cold winter months. In the photo: A gathering of people at a distribution point of food, equipment, medicines and additional vital products in Ansongo, Mali. 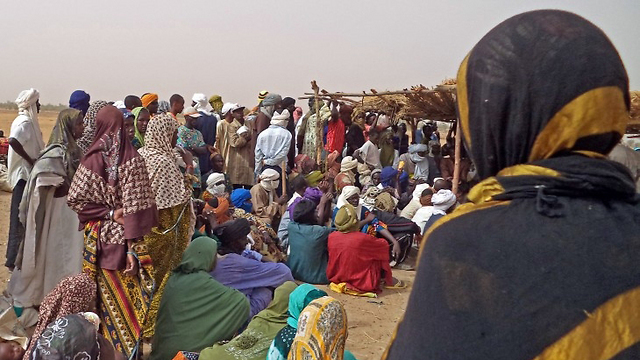 Thousands have fled northern Mali in recent months, following the widespread violence involving Islamic rebels and local government forces. 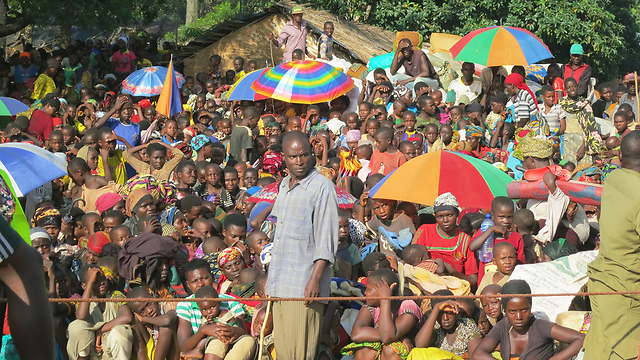 In the photo: Thousands of refugees from Burundi crossed the border to Kagunga in Tanzania. Burundi President Pierre Nkurunziza’s decision to run for a third Presidential term infuriated his opponents and led to a great bloodshed in the African country. Thousands of civilians fled to neighboring countries Tanzania, Rwanda and the Democratic Republic of Congo. There are an estimated 112,000 Burundian asylum seekers, 70,000 of them in Tanzania, in refugee camps. 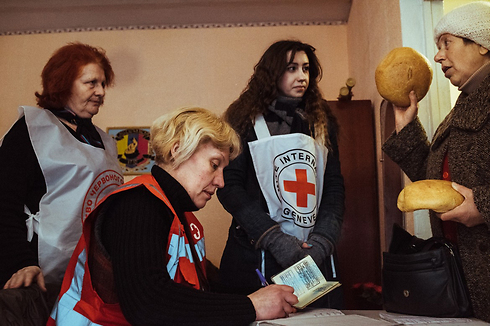 In the photo: Red Cross volunteers in Lugansk distributing bread to Ukrainian citizens who left their homes following the fighting between the national army and the pro-Russian rebels. More than 8,000 people have been killed in the war that broke out in Eastern Ukraine in April 2014, following the revolution that ousted the pro-Russian President Viktor Yanukovych in Kiev and replaced him with pro-Western government. The ICRC is considered to be the ‘watchdog’ of international humanitarian law, and bases its activities on the four Geneva Conventions of 1949 and the additional protocols of 1977 after the Vietnam War. 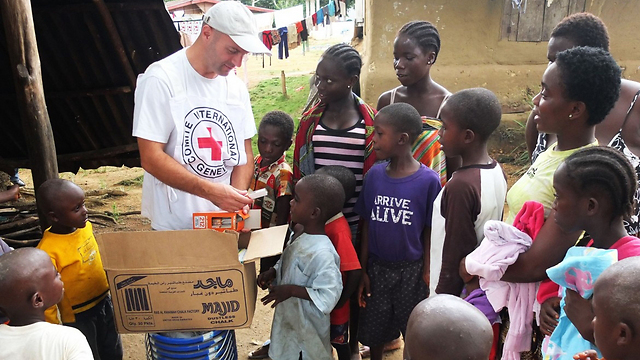 These Conventions provide the International committee of the Red Cross with the right to hold different activities, such as assisting injured or sick soldiers, visiting prisoners of war, re-establishing communication between family members separated as a result of violent conflict, and providing assistance to citizens and guaranteeing a proper treatment to those protected by international humanitarian law – victims of war, armed conflicts and natural disasters. The ICRC was founded in 1863 and its headquarters is located in Geneva, in neutral Switzerland. Its establishment was initiated by Jean-Henri Dunant (1910-1828), a businessman and philanthropist Swiss, after witnissing the war between France and Austria at the age of 30. The war left him with a deep impression after observing the wounded soldiers who did not receive adequate treatment, and immediately after the war, he founded the organization.